Thuan B. 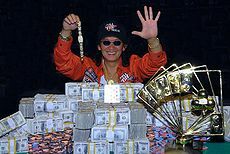 "Scotty" Nguyen (born October 28, 1962 in Nha Trang, Vietnam) is a Vietnamese American professional poker player who is a five time World Series of Poker (WSOP) bracelet winner, most notably as the winner of the 1998 World Series of Poker Main Event and the 2008 WSOP $50,000 H.O.R.S.E. World Championship. This win also made him the first and currently only player to win both the WSOP Main Event and $50,000 H.O.R.S.E. events. He also stated that the only type of World Series of Poker event he has yet to win is 2-7 lowball. Nguyen is one of the most active players in professional poker today, and from 2000 to 2004 he finished in the money in more than 100 events. After making several World Poker Tour final tables, Nguyen eventually won a WPT event in January 2006, defeating Michael Mizrachi heads-up in the fourth season Gold Strike World Poker Open when his A♠ Q♠ made a flush against Mizrachi's A♣ J♦ on the very first hand of heads-up round. With this WPT victory, Scotty became one of only 5 people to win both the main event of the World Series of Poker and a World Poker Tour title. Nguyen earned a second place finish at the 2007 World Series of Poker in the seven card stud high low split eight or better event won by Eli Elezra. Scotty stated after the event that he hadn't played cash games in over two years because he enjoys a friendly environment which is difficult in serious cash games. Scotty also nearly made the final table of the 2007 World Series of Poker Main Event, finishing in 11th place out of a field of 6,358 and earning $476,926. At the 2008 $50,000 World Series of Poker H.O.R.S.E. event, Nguyen exhibited what many have considered objectionable, and even rule-breaking behavior. In the broadcast of the prestigious event, Nguyen was shown drinking numerous alcoholic beverages while swearing and scolding others at the final table, drawing criticism from commentators. Following the event, Nguyen issued an apology to his fans and stated that the event's editing depicted him unfairly. He also cited issues like exhaustion, frustration with the perceived gloating of Michael DeMichele, and pressure to succeed as reasons for his unconventional behavior. Nguyen later formally apologized to the fans in an interview, and said that he no longer blamed any other players for his behavior, and that there was no excuse for his behavior at the 2008 H.O.R.S.E. event. In 2009, Nguyen won the inaugural LA Poker Classic $10,000 H.O.R.S.E World Championship at the Commerce Casino's annual LA Poker Classic Series. This 1st place finish earned him $339,743, and further cemented Nguyen's reputation as one of the greatest masters of all variations of fixed limit poker. As of 2014, his total live tournament winnings exceed $11,700,000. Of those winnings, $5,100,999 have come at the WSOP. Nguyen has also made appearances on the Ultimate Blackjack Tour playing Elimination Blackjack.